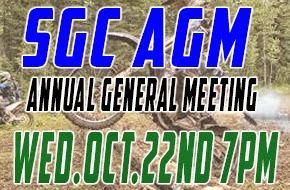 Second Gear Club Annual General Meeting Wednesday, October 22nd at 7:00pm at Siggi's house. Webcam available for those that can't physically attend. other possible events - Mitch has cool idea for winter riding...he's looking into info. the SGC has been invited to host one of 4 events part of the CNXC series. Round 3 protest - the outcome and how we as a club will strive to support our organizers to host events (this is not a session to vent, but an opportunity to improve on an already awesome club that has been hosting events since 1999). Yearend party plans - we have a fantastic event planned and we want to promote that we want to put a twist on what this evening is all about....it's not just for those receiving awards, it's a PARTY for everyone and will be the best night ever! The banquet organizers have me on a strict schedule...I think you all will be impressed. Our amazing racers, organizers & volunteers and SPONSORS!